At CRD we have designed and manufactured equipment for Flow Chemistry applications for many years, supplying solutions to diverse customers such as GSK, Gurit and The Innovative Technologies Group at Cambridge University. Our solutions cover both tubular and continuous stirred tank reactor formats, with options for mixing that include mechanical, oscillatory flow and static mixers. We have a range of standard products which can be tailored to your specific requirements. The Polar Bear Plus Flow Synthesiser takes advantage of our advanced cooling technology and combines it with the ability to heat - no solvents, ice or heat transfer fluids are needed; just plug it in and set the desired temperature from -40 to +150C. This flow chemistry accessory comes with a wide range of coil reactors and mixers. 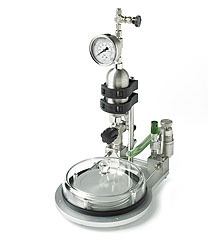 The Salamander tubular reactor provides the cost effective way to enter the flow chemistry field on a lab scale. The Gastropod Gas Introduction Module is a �tube�in-a-tube� flow reactor which allows efficient mixing for gas-liquid reactions in flow chemistry. Our Chameleon offers 4 stirred tank reactors (CSTRs), connected in series for continuous processing and is available at a range of scales. A useful solution in Flow Chemistry application when solids are present. Our Rattlesnake Continuous Crystallisation concept is a novel technology capable of delivering kilos of your desired product. in multiples of 6 or 16. Oscillatory Flow Reactors offer highly effective mixing in tubes for continuous processing. A range of tube geometries and system configurations are available. Parallel flow micro-reactors for evaluating gas phase and trickle bed catalytic reactions.